The following are illustrations done during my Illustration 4 class. They are in order of when the assignment was given. Each piece was done using Adobe Photoshop CS6. 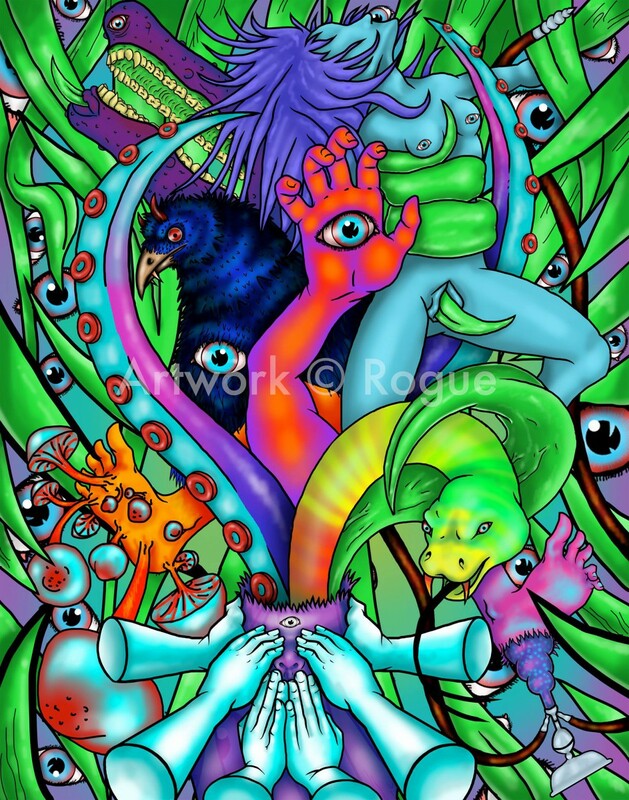 This piece is the result of a psychedelic theme but with a moral twist. The purple being at the bottom/middle of the screen is known as The Wisdom and it is seen following the Three Wise Monkey’s rule of “see no evil, speak no evil and hear no evil.” However, it’s mind is evil; we can see all manner of monsters and nightmarish creatures spewing out from it’s head. The creatures names are as follows: (bottom left to top right) Shroom Foot, bE eViL (bodiless arms), Nightmare (tentacle and eye monster), Basilisk (snake), Gluttony (tongue monster), Bong Foot, Dark Crow (black bird), All Seeing (hand with eye), Fang Sentinel (purple teeth monster) and The Faceless (woman with no face). Morale of the story, not all people who follow the path of righteousness are good. This piece is the result of a conceptual portraiture assignment. During the time this assignment was given, I was really into AMC’s The Walking Dead s decided to make the show, and my favorite characters, the subjects for this piece. 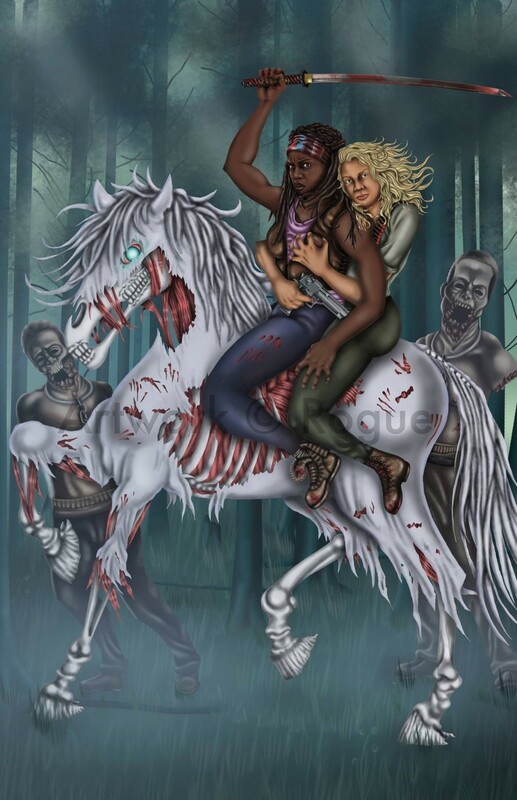 Here we see Michonne and Andrea from the show riding a top a white zombie horse and with Michonne’s two zombie friends trailing behind them. The piece is a modern spin-off of a lesbian prince charming meets zombies! This piece was featured in my school’s student art show. This piece is the result of a Times Magazine Cover assignment. The piece was done with the theme of celebration for having a year of marriage equality in New York City. 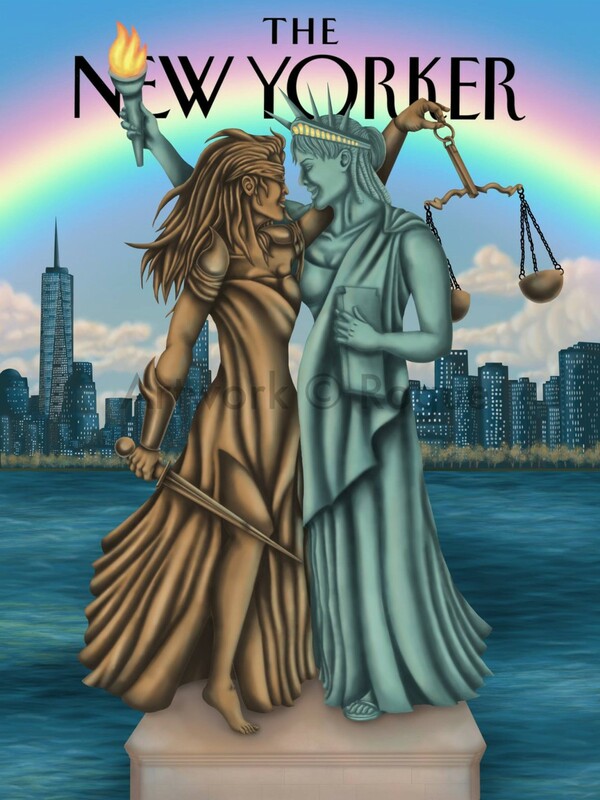 The subject is Lady Justice and Lady Liberty, who are featured celebrating on top of Lady Liberty’s pedestal. This piece was particularly enjoyable to do as I have always been a equal rights activist and out gay identified person for many years.